Separated Under Zero Tolerance, A Honduran Man Finds His Daughter Jose Eduardo was separated from his daughter Yaimy after crossing the U.S.-Mexico border last spring. He was deported, but his daughter remained in U.S. custody. Now, he has returned to find her. Jose Eduardo hugs his 15-year-old daughter Yaimy, 10 months after they were separated at the U.S. border. A desperate father, once deported, has trekked 2,000 miles from Honduras to cross the border again and reunite with the daughter who was separated from him last spring. He is one of more than 200 parents who were deported to Central America while their children were placed with sponsors or in foster homes in the United States. 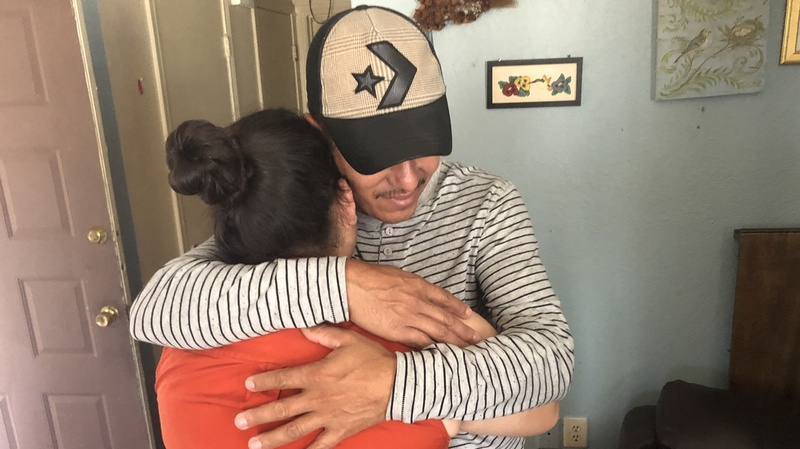 Last week, Jose Eduardo pushed open the door to Apartment 204 in Arlington, Texas, and threw his arms around his 15-year-old daughter, Yaimy. They'd been apart for 10 months. They wept. Then they went out for shrimp and rice, and talked about their remarkable journey. This was Jose's second trip to Texas. The first time was in May, when he and Yaimy traveled from their village in Copan, Honduras, to Reynosa, Mexico, floated across the Rio Grande to Hidalgo, Texas, on a smuggler's raft, and surrendered to green-suited agents. He says they were fleeing marauding gangs who had marked them both for death. The last time Jose saw Yaimy, she was standing in a frigid border patrol holding cell. He was marched off to court to face charges of unlawful entry. When he returned, she was gone. "When we entered immigration," he said, "I never imagined they would separate us. I told my daughter, 'Don't worry! We're going to be together.' I never thought they would separate us. I asked the officials, crying, 'Where is my daughter?' And they replied, 'We don't know.'" He said they told him, "You're going to be deported and your daughter will stay here." NPR agreed not to use the family's surname because they worry that speaking out could affect their asylum cases. Jose's story is similar to that of thousands of parents who have been torn from their children by the Trump Administration. Last spring, immigration officials defended the so-called Zero Tolerance policy, saying they were compelled to remove a child when their parent is jailed for a federal crime. But the international community and domestic critics said family separation was an atrocity. Trump rescinded the practice in June. Then came revelations from the Office of the Inspector General of the Department of Health and Human Services that potentially thousands of additional families were separated before Zero Tolerance. When Jose was deported, Yaimy was sent to a government-contracted youth shelter in South Texas where they played soccer in the warm gulf winds. Nearly 200 other girls from Central America were being held there. "Lots of girls offered to be my family," she says, "but that's not what I wanted. I wanted my papa. I didn't know what to do. I passed the time crying. The staff was good to us. They treated us well. But I missed my papa a lot." Roughly 130 shelters across the country are housing thousands of migrant children who arrived without their parents or were separated at the border. 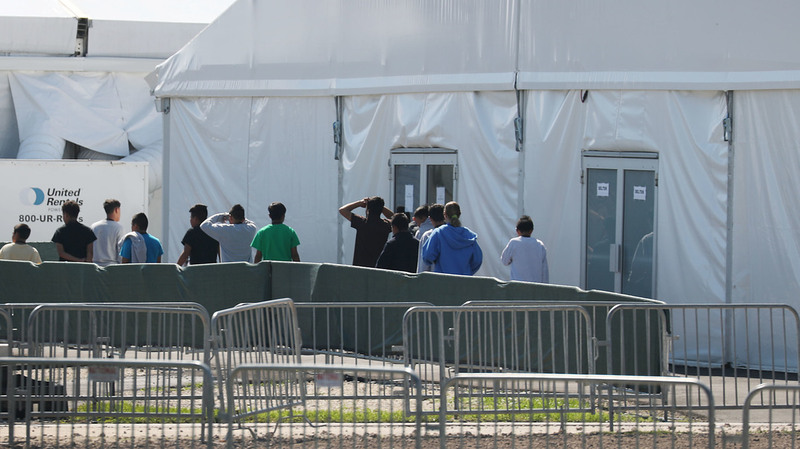 Children are seen here as they walk through the Homestead Temporary Shelter for Unaccompanied Migrant Children facility in Florida. "Some of the girls confided to me that they had been treated very badly on the journey to the border," Yaimy continues. "Some were sexually assaulted. At the shelter, some of them would cut themselves. They cried and cut themselves. We couldn't have sharp objects in our room. I cried, but I never cut myself." After three months at the shelter, Yaimy was discharged to live with an adult cousin and his family in the Dallas-Fort Worth area. That's where she's been staying for the past five months, in a low-budget apartment with a torn sofa and a large painting of the Last Supper. She's been going to school, taking English classes, attending church, and playing with four rambunctious cousins. Yaimy was one of nearly 3,000 children forcibly removed from their parents under Zero Tolerance. Most families have been reunited. But some 200 parents were returned to their home countries without their children. Many say they did so reluctantly, or against their will. Earlier this month, a group of 29 determined parents returned to the border. Jose was among them. They crossed the Mexicali port of entry to ask for asylum and demand to be reunited with their children. According to a pro-immigrant group, Al Otro Lado, most of the 29 parents are still detained. But immigration agents released Jose, who was traveling with his 9-year-old son, Anderson. "As sad as it sounds, [Jose] is now one of the lucky parents," says Lee Gelernt, a senior attorney with the ACLU who has sued to force the government to reunite the families. "There are still hundreds of parents in Central America who have not reunited with their children. We're hoping some of them will be allowed back, but at this point very few have been able to come back." I cannot imagine being separated from one of my children. We felt that our faith compelled us to open up our home to do whatever possible to help the families that were separated at the border. Jose, Yaimy and Anderson consider themselves doubly lucky. They're together. And on Sunday they boarded a flight from Arlington to Seattle, where they've been taken in by a generous family while they await their day in immigration court. Sarah Riggio is a stay-at-home mom and a devout Catholic. She found out about the Honduran family on a Facebook post, and decided that her family had to act. They have a spare room in their home. "When we first heard the news of the family separations taking place at the border, we were absolutely sickened by it," Riggio said by phone. "Having five children of our own, I cannot imagine being separated from one of my children. We felt that our faith compelled us to open up our home to do whatever possible to help the families that were separated at the border." Jose marvels at his turn of fortune. "We're very happy because they're beautiful people, with good hearts" he says with a huge smile. "I believe God brought us all together." But with this experience I'm not afraid to be out in the world. I want to know even more places. I wasn't this way in Honduras. I've changed a lot. As for Yaimy, this immigration odyssey has exposed her to the world outside of her village in a way that she never anticipated. "In Honduras, I led a boring life. I didn't like to leave the house much," she says. "But with this experience I'm not afraid to be out in the world. I want to know even more places. I wasn't this way in Honduras. I've changed a lot." There may be more reunions like this to come. Last week, a federal judge ruled that the Department of Health and Human Services, which is responsible for the care of unaccompanied migrant children, might have to find and reunite hundreds, if not thousands, of migrant families that remain separated. Because, he said, families belong together.